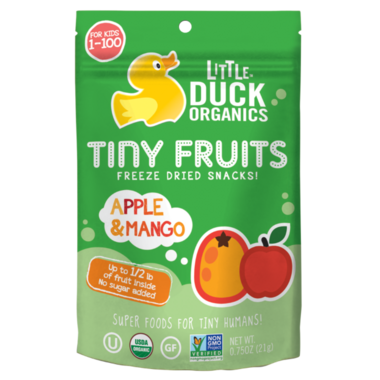 Little Duck Organics Tiny Fruits snacks come in convenient pouches that are packed with 100% real fruit and are full of the vitamins and minerals your child needs for healthy development. This Apple & Mango Tiny Fruits pouch is filled with up to a whopping half-pound of organic apples and mangos! The fruits are diced and water is freeze-zapped out. What you get are vitamin and nutrient-dense, freeze dried fruit snacks. NO added sugar, NO preservatives, Nothing but the best! Tiny Fruits are USDA Certified Organic, Project Non-GMO verified, gluten-free, kosher, dairy free and nut free. Superfoods for super humans, big and small! My 10 month old loves these and gets excited when I even show him the package. We save them for a treat since they are quite pricey. Our grandson didn't care for the taste of them but the children next door , which are younger , did. My baby girl LOVES these! So do I incidentally. Wish there were more in the package. Our little guy absolutely loved these! They're a bit expensive yes but they're a great healthy snacks that leaves very little mess. Great for when out and about or at home and you need something fast to give your little one.